I still cannot believe this has happened, but today we had to put down my most amazing, best beloved cat Soda. She was fine yesterday morning, but yesterday afternoon she started a very quick and heart-rending deterioration. It was most likely a blood clot or a tumor. Yesterday afternoon she could not move her hind legs, and by early this morning she could only move her head. She was also clearly suffering, so we made that awful, final decision to end her pain. Soda was with me for all of her 17 years, since she was a tiny kitten. I cannot believe my constant feline companion is gone. 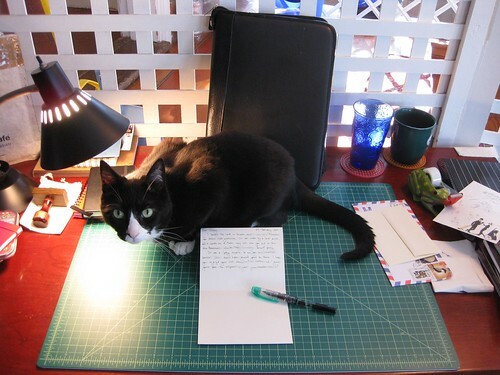 Longtime blog readers will know that Soda was a mail cat extraordinare, charter member of the Feline Postal Brigade, and a frequent "helper" with my letter-writing. I wanted to share this news of her passing with you all, with a plea for understanding that I am absolutely devastated and may lay low from letters and blogging for a while. A very kind relative asked about donations in Soda's name; I will say that she came to me from the Gifford Cat Shelter, which is a truly wonderful no-kill cat shelter (or, as they say, "sheltering home for cats") that I support wholeheartedly. If you are one of those wonderful souls who is moved to make a donation in her memory, that would be the place both she and I support. We are down to one cat - the ever shy and retiring Magic, who, while not much of a mail cat, is still a wonderful kitty and a great comfort. (Here's the irony: Magic is the one with health problems; we expected to lose her long before Soda.) She is sad along with us today; while she and Soda were not littermates, they were they same age and spent all but their first weeks of life together. Now I am off to cuddle Magic... please love and appreciate your pets (and all loved ones!) while you have them. You never know when you may lose them. I am so sorry to hear about your kitty, Soda. We lost a beloved sweet Boxer boy a couple of weeks ago. Like your Soda, he was fine and not the one we were expecting to lose. These unexpected losses are the hardest. My heart goes out to you. Thanks so much for your kind thoughts, Pearl - my heart goes out to you also for your loss of Boxer. Sorry to hear -- big hug to you. i know how sad you feel. Thanks, Pamela... I am just wrecked. My best friend lost her cat very suddenly yesterday. I ADORED her cat and feel the loss as well. Her cat appeared to be well (seemed happy, ate well, was playful) but after spending time on the patio on a hot day, she came inside and collapsed. My friend rushed her to the Emergency Vet where they tried to save her, but were unsuccessful. My friend has 3 other cats, but this one was SPECIAL (to me, too!) So you have a cat-loving friend you've never met who is suffering the same loss as you. My own cat is 17 and has advanced kidney disease, so I will have to make that painful decision to put her down at some point. But for now, she seems to be doing OK. I'm so sorry for your loss. When it comes suddenly like that, it is a lot harder to accept because you didn't have time to prepare. Hugs. Thanks so much - so sorry to hear of your friend's cat, too... tragic and sad. That is always a tough decision to make, especially when it's unexpected. You have my condolences. Thanks so much, Kathy - extra hugs to Alice! Oh, Ilona, I am so very sorry to hear of Soda's death. I know the heart break of losing a beloved companion and is even more difficult to have to euthanize them. But it is the most loving thing you can do to help them out of suffering, and be able to be there with them as they pass over the threshold. Blessings to you all and a special prayer for Magic. Thanks so much, Gini... I appreciate your kind words. I know that ending her suffering was the kindest thing to do, but you're right - so hard to follow through with euthanizing. Thanks for understanding, and for that special prayer for Magic... she is really having a tough time now, too, having been with Soda for all but 2 months of her 17 years. It's never easy to lose an old friend regardless the circumstances. From my kitty crew and me to you, please accept our condolences on your loss. I've just seen this. I am so sorry. We lost our dear cat Morgan in may. It's hard to lose such a dearly loved family member. I am very sorry. Thanks so much, Eunice - and I am so sorry to hear of the loss of Morgan. We are grieving together. I am sorry to hear about your cat. I once had a cat that had cardiomyopathy, and that is what happened to him. Tomorrow I am taking my 15 year old cat to the vet for the first time since 2006 (she is not cooperative and tends to poop in her carrier when she gets scared). Thanks so much. Good luck with your cat's vet visit. We have a vet who does house calls because our cat Magic gets so stressed out being taken out of the house to the vet's office, with all its unfamiliar sights, sounds, and smells. It's such a sad place to be, having to make that decision and then missing those familiar paws padding around. Sending gentle thoughts your way. Our pets bring us such joy in our lives...and ask really nothing in return except for their food and shelter. So sorry for your loss. My deepest sympathy to you in the loss of your sweet Soda. She will be missed. so sorry on the loss of soda ...May she RIP and she will be waiting when you get there . So sorry to know you've lost a long-time furry companion. It's never, ever easy to lose one, but the ones which have been with you through a lot of your own lives are the hardest. I hope you will eventually find it in your heart to reach out to another kitten, and share the future with him or her.